The DASH diet (Dietary Approaches to Stop Hypertension) was created to assist in lowering blood pressure and high cholesterol. It can also prevent high blood pressure where people are susceptible to the condition. One of the primary aims is to reduce sodium (salt) intake. The diet offers two levels of sodium intake – 2400mg down to 1500mg. The DASH diet has now been reformulated in an easier to follow format by author, Marla Heller, who has been working with the diet as a dietitian for over 10 years. In her book, she outlines the high blood pressure diet in the easiest way to follow allowing for the most successful results. The DASH diet is designed to lower blood pressure and cholesterol without the use of medication. Exercise and diet advice for no matter what a person’s lifestyle. The diet is high in the essential nutrients, calcium, magnesium, and potassium. Exercise is an important part of the DASH diet since exercise can lower blood pressure, strengthen the heart, and improve circulation. 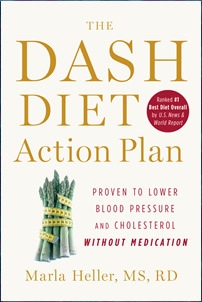 The DASH Diet Action Plan: Proven to Lower Blood Pressure and Cholesterol Without Medication retails for $22.99. This is a highly effective and recommended program for anyone suffering with high blood pressure and/or high cholesterol. The US NHLBI (National Heart, Lung, and Blood Institute) sponsored a serious of clinical trials, and determined that the DASH diet was successful in bringing down high blood pressure. In fact, results would happen within as little as 2 weeks. The author has many years of experience dealing with hypertension and dieters will be benefited by her expertise. The original DASH Diet can be downloaded here. Does anybody know how to follow the DASH diet without loosing weight??? I am already skinny, and now that I’ve started the DASH diet am loosing weight that I can’t afford to loose! I’ve been on this diet for two years now. There’s plenty of food and variety, and best of all, it has kept my blood pressure at a point that doesn’t require medication, so it’s achieving the aim my doctor and I had in my following it.